Do You Know This About Suicide? Suicide rates in the United States have remained stubbornly high in the US since 1950, but among some groups they have risen sharply. 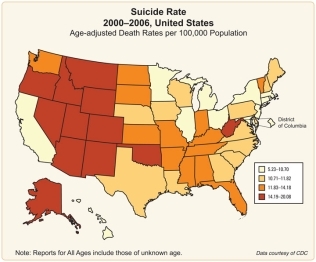 “Suicide rate” is defined as the number of completed suicides per 100,000 residents. Completion of a suicide in the U.S. occurs every 16 minutes. Among young people under the age of 25, suicide is the 2nd leading cause of death. There are 117 suicides every day in America. 22 American veterans take their own lives every day. Guns are the means used in 50% of suicides. The rate of suicide is highest, and rising fastest, among middled-aged white males. Women are up to 10 times more likly to make an attempt than men, but men die by suicide at a rate of 3.5 times that of women (men use firearms). Within the Lesbian, gay, bisexual, transgender and gender questioning population, suicide is the first leading cause of death. Suicide is the second leading cause of death among college students. Between 1950 and 2010, the rate of suicide for children ages 5 to 14 increased by 300%. The rate of suicide among young people age 15 to 24, more than doubled in the same period. 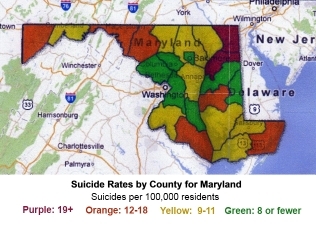 Suicide rates are much higher in rural areas than in urban or suburban neighborhoods.